3 Bedroom, 2 bathroom laundry facilities and an open concept kitchen and living. Every room has a beautiful unobstructed view of the ocean and the sand beach. The beach is right in front of cottage with only a step down to the sand. You can walk for hours along this quiet beach or out to the two sandbars directly in front of the cottage at low tide. Newly set up cottage with new beds and living room furniture. The cottage is fully supplied with kitchen equipment, linen, laundry facilities, barbecue, fire pit, internet and satellite tv. Second fridge and cabinet storage for a weeks' supply of groceries at back of cottage. Even a second TV room if kids need a break! Please check the daily price VRBO/Home Away show - it may be in USD or CND. I grew up in PEI but moved away as an adult. 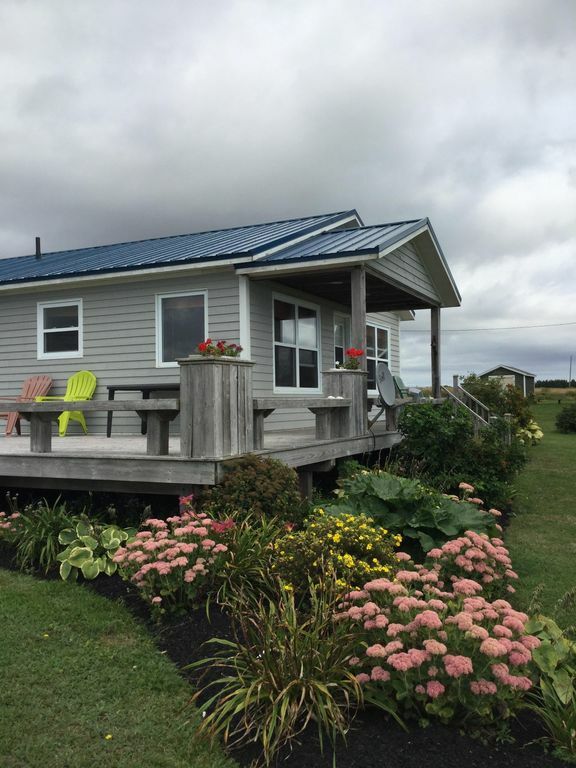 I wanted to make sure my kids had a strong connection to beautiful PEI and enjoy the summers I did as a child, so my husband and I looked for a long time to find this perfect location to share with our children. We spent many happy summers there and now we enjoy sharing it with other young families each summer. We chose this property because we had little kids and wanted a safe sandy beach to play on. The sunsets are almost always amazing from this location. Unobstructed pink sunsets over a beautiful cape. The sounds of the ocean are soothing and relaxing. The cottage is not huge but very comfortable, fully equipped and cozy to spend family time playing games, making supper, roasting marshmallows on a fire near the ocean, playing soccer in the front field or cooking lobster and then settling down to watch a movie together. You can watch the waves hitting the beach and sandbar from the cottage deck. The cottage is located directly on Northumberland Strait. Beautiful sandy beach in front of cottage. It is wheelchair accessible with the exception of two very small ledges. Possibly not ALL of the cottage is easy to maneuver around but one bedroom and one bathroom all kitchen area are. A beautiful property with every comfort of home! From the views, to the comfortable living spaces, this is the perfect spot for a relaxing vacation. Our family thoroughly enjoyed each days stay. If weather didn't allow for a beach day, we had more than enough to do with the puzzles and games available at the cottage. The beds were comfy, and warm evenings were made so nice by the cool ocean breezes. We all felt like a week wasn't enough, so our next visit will have to be for at least two weeks! Thank you for a fantastic visit. It was just what we needed! Having Donna as our host, she was helpful and hands off- but every instruction and necessity has been thought of! Our group of 6 (3 adults and 3 teens) had a wonderful time at this home as part of our family vacation on PEI. The house had plenty of space for all of us, including a full kitchen, two living rooms, and an extra fridge/sink off the middle hall for functionality. The home is modern, charmingly decorated, and has everything you could need, including towels, laundry, and extra blankets. And you can't beat the view! We were a little surprised that the home is on a dirt road off of Factory Road, but we discovered that is common in this area of PEI and we didn't have any trouble navigating the road in our minivan, even after some significant rain. And do stop by the 'factory' at the end of the road to get frozen crab or lobster--it is delicious and very reasonably priced! This cottage was very well set up and had everything one would need for a lovely stay. The two bathrooms are a plus and laundry facilities make this rental very desirable. We enjoyed our stay but should have lingered longer on the island! LOved the whole experience! The property was large and private, and the views and ocean Frontage were breathtaking. The house was well-equipped and very clean, nothing was forgotten in making this a great experience. I can see many more returns for our family. You can spend the day at the beach or travel to nearby beaches with lighthouses and local restaurants in areas such as Point Prim or Wood Islands or go farther to nearby towns of Montague, Murray Harbour or Charlottetown. There a many golf courses on PEI if that is your sport and many different beaches to visit.